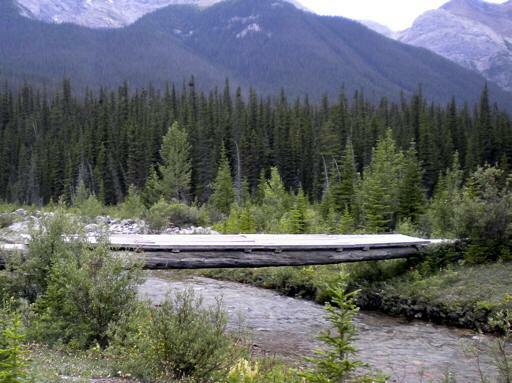 The Pole Bridge (Campsite #2) is at the northern end of Spray Valley Provincial Park, off Hwy 742, 7.3 km south of the Three Sisters Drive intersection in Canmore, and 2.1 km north of the Riding Ridge. The easiest way to access the site is to follow Hwy 742 and park at the Goat Creek Picnic Area. Walk south along Hwy 742 for approximately 200 meters. At the point where the utility lines cross Hwy 742 you will see a gravel road to your right (west). Turn right and follow the gravel road approximately 0.7 km downhill until you reach a clearing. Turn right and continue across the clearing, passing the “Get Goin’, Cowboy” Hillside (Fight Hill), and the Dozy Embrace site. If you encounter temporary fencing in this area, go around it to the right. As you approach Goat Creek, you will see the familiar pole bridge and campsite. For pictures taken during a hike to this location, see “Hike to Campsite #2” in Albums. Campsite #2 is remarkable in many respects. Its silence, for instance. 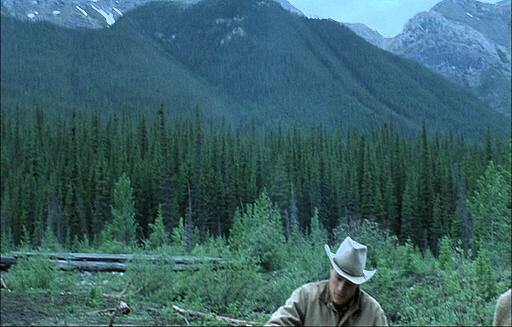 Although it is quite close to the road (Highway 742) and equally close to a small hydroelectric generation station, the surrounding mountains and hills insulate it to the point that all we hear in this scene is Jack’s animated singing.